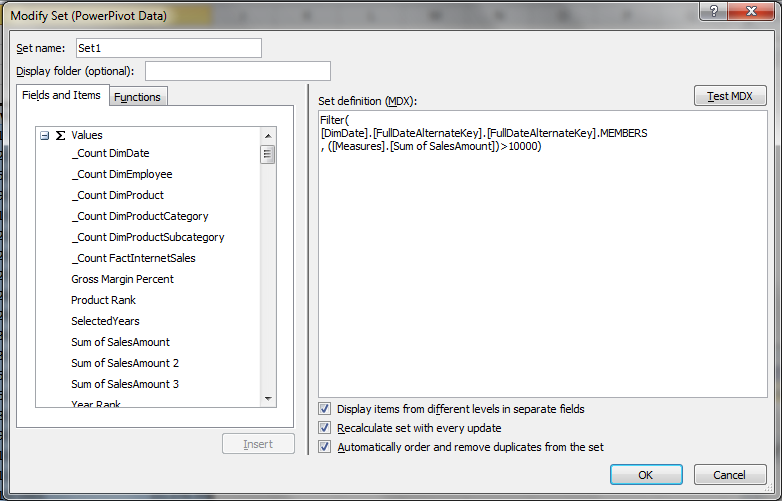 The combination of the filtering functionality built into PivotTables, and the ability to delete and reorder tuples in a set without needing to edit the set expression itself that the Excel named set functionality gives you, means that you can usually implement the filters you need in PowerPivot without needing to resort to MDX. However there are some scenarios where knowing the MDX functions that allow you to filter a set are useful and in this post I’ll show a few of them. The Filter() function is the Swiss-Army penknife of filtering in MDX: it can do pretty much anything you want, but isn’t always the most elegant method. It’s quite simple in that it takes two parameters, the set that is to be filtered and a boolean expression that is evaluated for every item in the set and which determines whether that item passes through the filter or not. What I’m doing is passing the set of all dates into the first parameter of Filter() and then, in the second parameter, testing to see if the value of the tuple ([Measures]. [Sum of SalesAmount]) is greater than 10000 for each item in that set. As I’ve mentioned before, it’s very important that you remember to check the ‘Recalculate set with every update’ button if you want the filter to be re-evaluated every time you change a slicer, which you almost always want to do. The NonEmpty() function also does filtering, but it’s much more specialised than the Filter() function – it filters items from a set that have empty values for one or more tuples. As with the Filter() function its first parameter is the set to be filtered, but its second parameter is another set, each of whose items are evaluated for each item in the first set. If one item in the second set evaluates to a non empty value for an item in the first set then that item passes through the filter. Notice here how the dates are displayed in descending order for the Black column, but no other – that’s how you can tell that the TopCount() function is doing what you want. Here I’m taking the set of all members on the FullDateAlternateKey level of the FullDateAlternateKey hierarchy, passing that to the NonEmpty() function to return only the dates that have values for Black products and Sum of SalesAmount, and then getting the bottom 10 of those dates. In part 5, I take a look at running MDX queries against a PowerPivot model. Leaving the curly braces has no effect whatsoever. Do You have any ideas how to get this work? Yes! I just figured it out also myself 🙂 from https://social.msdn.microsoft.com/forums/sqlserver/en-US/bfa198db-cb51-478c-afaf-81c7317008c4/problem-with-cubeset-filtering. Great many thanks to you! Awesome blog! Hi Chris! I stuck in MDX again. =( Is there any way to return a set with only one column after using GENERATE function? It always return 2 columns but I need just result of [MFC].[Products].[Company].Members. No, strangely it returns companies which weren’t in TOP 5 of any period, but not all companies. But it looks closer to solution I think. It will return the correct companies, I promise, but it will union the results of the topcount() so you won’t see any duplicates. Also, if you’re using this in a query, remember you’ll need to display the dates somewhere otherwise you won’t see any meaningful measure values. Another idea would be to use your original expression and then pass the set to the Extract() function. Firstly thank you very much for this useful post. I have a question and hopefully if you have some time you can assist me in please? My objectives is to have a pivot table and a slicer with 2 selections of ‘top 3’ or ‘everything’. Question: How do i go about getting the subtotal if the slicer selection if ‘top 3’? I currently have a subtotal of all department if the slicer selection if everything but not top 3. Is this an expression you’re using in a named set? 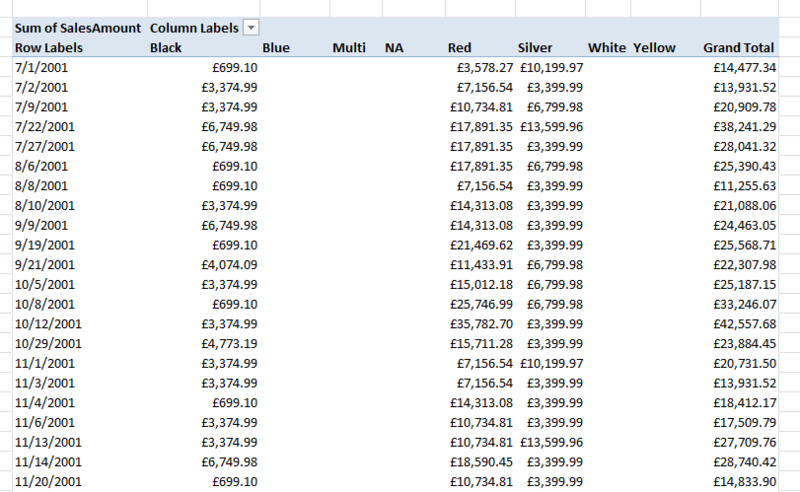 Which version of Excel are you using? Yes Chris, i am still very new to all powerpivot, mdx and dax stuff. This is the formulas i used in the manage named sets section and i am using Excel 2013. 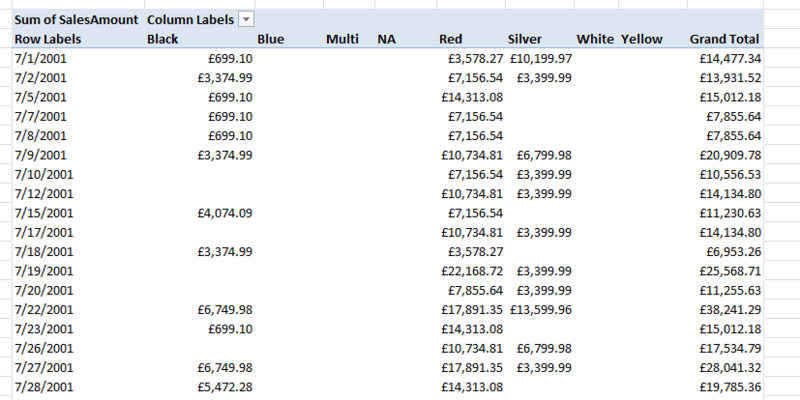 Unfortunately, with Excel 2013 there isn’t a way of doing this – you would need to be able to create calculated members to get the subtotals I think and this isn’t possible with Excel 2013 and Power Pivot. Oh, what a shame. Well nothing you can do about it guess. Thanks a lot for your time Chris. Cheers. This seems to be close to what I’m trying to do in Excel 2013 with CUBE functions but I’m having trouble adapting it to my data. I have “carts” in hospitals that carry various supplies. I have a slicer that lists the carts, and I can return order quantities and spend based on measures. But I’m having trouble returning basic information about the cart itself. The cart table is CartList. So if I click on DNW-013 in the slicer I want to have a CUBE function to show me that its region = Central. But I can’t figure out how to filter the CUBESET so that I can retrieve only the region value for DNW-013 in the slicer! Yes and no. 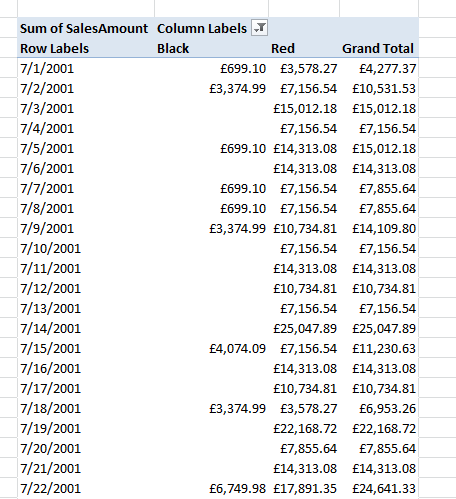 I have a PowerPivot data model but I’m trying to build the dashboard using CUBE functions so that the format stays the same for executives when they look at it instead of having the columns vacillate like a yo-yo depending on what filter they choose. I haven’t tried the solution in the link you pointed to, but it sounds like it would do the same column width changes as a pivot table? Really, isn’t there a standard CUBE format that can give other attributes of a value picked in a slicer from a Dim table? If someone picks a vendor, have the state or phone # appear? If someone picks the cart location code in my earlier example, to get the department and other info is very helpful. I tried some variations of the FILTER() code you had above but just get #NA results. This seems like it would be a very common need. After poking around and trying various combinations, this worked for me! I have absolutely no idea why… really it was a monkey banging on a typewriter creating a Shakespeare snippet. If there’s a cleaner way to do this I’d love to know. So for the location code “WHMC-009B” in cell $L$5 it correctly returns “South” as the region. I don’t know why CUBESETCOUNT accurately returns the slicer selection count if 1 or more values are selected but also returns 1 if the filter is removed. Very annoying. That’s why I also test for the CUBERANKEDMEMBER of the slicer to capture if All is the return value. There’s probably a better way to do that too. I’m glad you got this working – I’m pretty sure that a measure that returns text would be a cleaner way of doing this, though. If you’ve got an example I’d love to use it. Perhaps I wasn’t clear on what a newbie I am – I couldn’t figure out how to create such a measure… something using HASONEVALUE and VALUES perhaps? I’ve got a very peculiar CUBESET problem (related to your article above) and have reached an impasse trying to solve it. Hoping you might be able to shed some light. 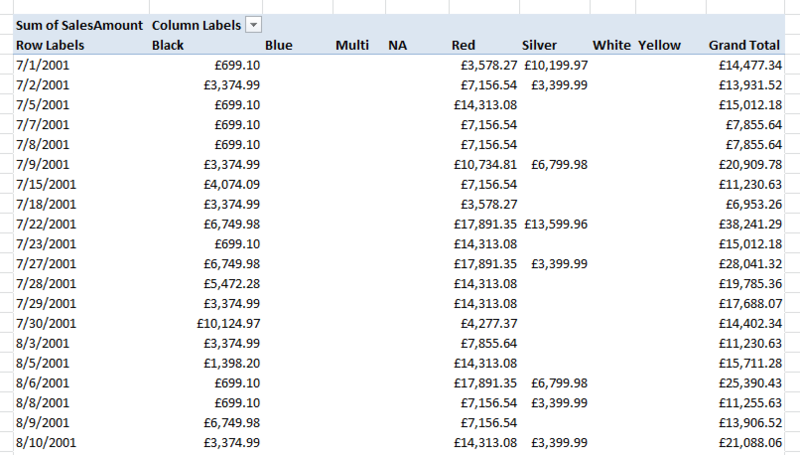 I’m after a set of Customer IDs, that have opted in to a particular product in a given month. When I’ve got this set, I then want to know how much revenue they have generated on a separate product in the same month. Revenue in this instances needs to be sliced by two additional dimensions. If I list the members out using CUBERANKEDMEMBER, I can query the individual members by the two additional dimensions. and get the corresponding revenue. If I query the set for revenue by the two additional dimensions I get NULL. I don’t understand why, and listing out the set becomes increasingly impractical if they get bigger. Is there something wrong with my syntax that would prevent the *set* from being sliced by additional dimensions? I’m self-taught (for better or worse) so apologies if my terminology is incorrect! The Excel report I’m building is connecting to a SSAS cube, and needs to be user friendly i.e. the end users can refresh a connection and/or change the month. As such, I’m somewhat constrained by the limits of cube functions and my knowledge of MDX. I’m just really puzzled as to why the set I’ve created cannot be sliced by these additional dimensions, but the individual members (when broken out) can be! Yes, but that doesn’t mean you can’t do this in a measure – that’s going to be by far the easiest and fastest way of implementing this kind of calculation. You can then use the measure in any report, whether it’s an Excel report using cube functions or not. How does creating an MDX set of Top 10 items compare to using the filter functionality in pivot tables / charts? Should I expect one to calculate faster? 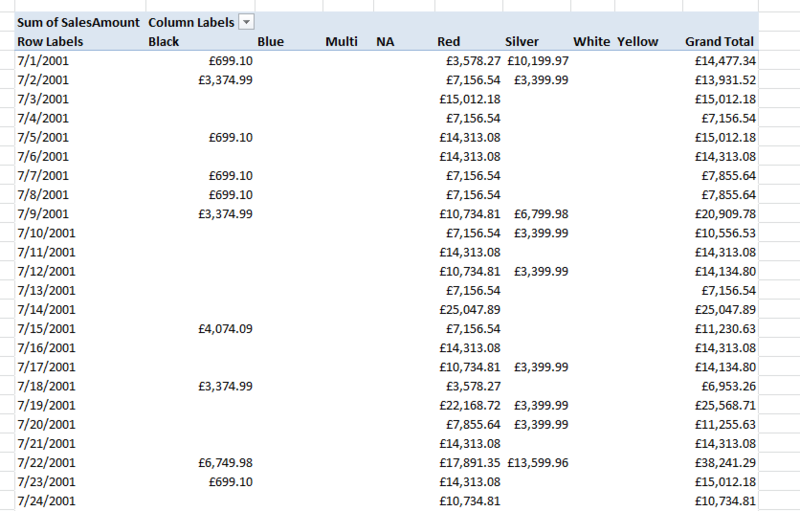 I’m using Excel 2016, and have lots of pivot charts showing Top 10 customers etc. In theory it should be about the same – you would use the TopCount() function in your named set and the PivotTable uses the same function. However there are lots of other things that could make a difference such as how the query is constructed, whether there are calculated members being used etc. I’ll do some testing and see if there’s any noticeable difference. 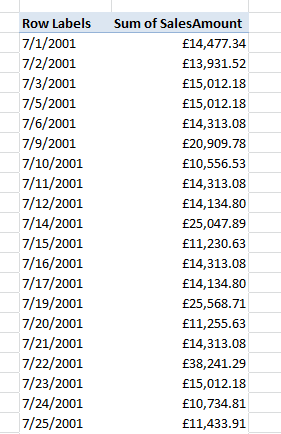 I’m trying to build a set containing the last 12 months, so I can create a rolling last 12 months bank balances chart in Power Pivot. 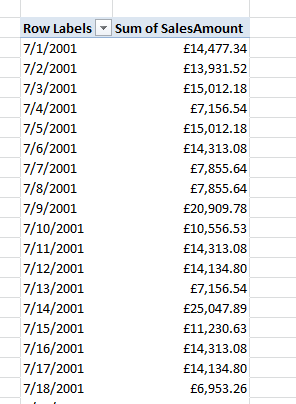 I have a table that I bring in through Power Query with the ‘latest’ month, so it would have to reference that. I’m brand new to MDX, is there any advice you can offer?